The Money Sorted evaluation and participation service will be delivered in partnership by Services for Empowerment and Advocacy (SEA) and ConnectMore Solutions. SEA will lead on the development of the participation element of the project in partnership with ConnectMore Solutions who will lead on the evaluation. Both organisations are committed to ensuring the lived experience of Participants and Money Mentors are used alongside the professional experience of Personal Navigators to positively inform the development and delivery of the project. Our focus will be to develop an approach where everyone associated with the programme can contribute their skills and experience to inform how this project and future services should be developed. WHO ARE YOUR EVALUATION & PARTICIPATION PARTNERS? SEA are a specialist provider of Empowerment and Advocacy Services with a substantial experience working with individuals and groups facing social exclusion and inequality. We think it is important to work shoulder to shoulder with participants and partners to promote a ‘strength based approach’ to our working practice, recognising and valuing that people are experts in their own lives and have the right to be meaningfully involved within the services they receive. The Participation Service will be led by Zoe Bendelow. ConnectMore Solutions are a provider project management service designed to support third sector organisations get involved in the design, delivery and evaluation of publicly funded projects delivered within the third sector. The organisation has extensive experience of working with third sector organisations on social inclusion issues across the East Midlands. Services provided include specialist business development support services which complement evaluation services. 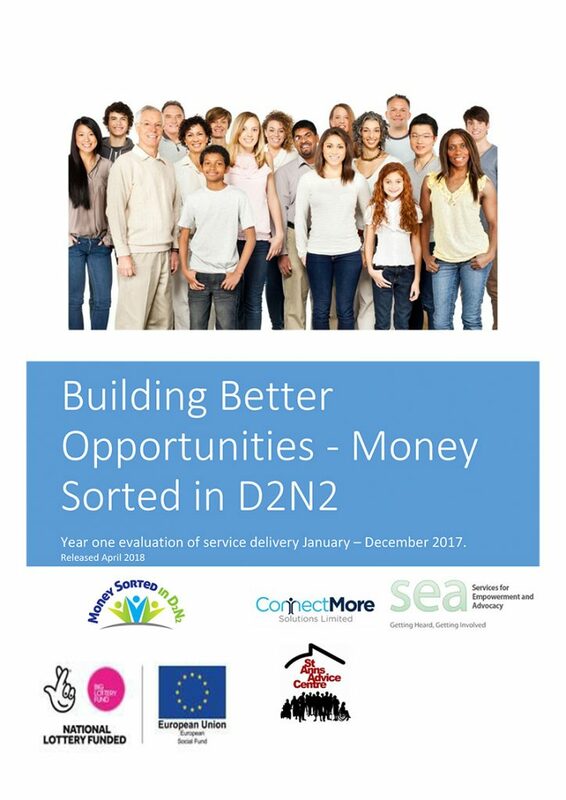 As the D2N2 Money Sorted Evaluation partner ConnectMore Solutions will be committed to working with SEA, Participants and Personal Navigators to help evaluate how individuals progress through the service and the outcomes they attain. This activity will not only involve analysis of data to understand trends but will also involve working with Participants and Personal Navigators to understand the real lived experiences of individuals using the service. The evaluation service will be led by Richard Hazledine. HOW WE WOULD WE LIKE TO WORK WITH YOU? For the participation service to work well it is key that the following things continually happen over the project. There are a range of Participation activities to harness participants skills and experience – we are aware that not everyone wants to get involved on a committee! Training and support packages are provided to meet the collective and individual needs of participants to contribute their experiences and skills to all activities they wish to support. If you are interested in learning more please get in touch and we would be happy to talk to you. The evaluation of the programme is all about finding out ‘what works’ and in ‘what circumstances’. For this to happen effectively we will not only analyse trends collated on Money Sorted systems but also remain in regular contact with Personal Navigators, Participants and Money Mentors involved in the day to day operation of the service. For the evaluation service to work effectively it is key that the following things happen over the course of the project. Data analysis within the evaluation process is used to support and inform potential participation activities.